This park protects remnants of rainforest and wet eucalypt forest that once occurred throughout the Blackall Range in the Sunshine Coast Hinterland. Pencil Creek cascades 120m over the escarpment to the valley below to form the Mapleton Falls. 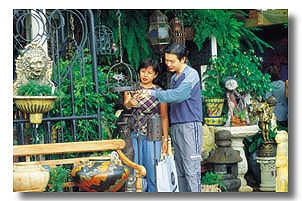 Popular for picnicking, bird watching and bushwalking. To reach this area, travel 13km west of Nambour to Mapleton. Turn north off the Mapleton-Kenilworth Road. The highlight of the National Park is the gushing waters of Kondalilla Falls, which cascade down 80m and form a series of crystal clear pools of water. The pools are popular spots for swimming in the summer months. Travel west of Nambour to Mapleton, continue toward Montville. Kondalilla National Park is signposted on the right. 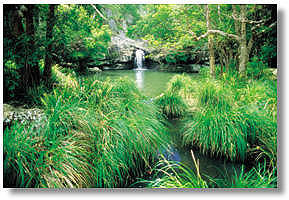 The Glass House Mountains are a group of 13 volcanic peaks the dominate the landscape of the Sunshine Coast Hinterland. 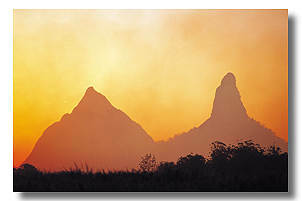 Four distinctively shaped mountains - Beerwah, Tibrogargan, Ngungun and Coonowrin are protected by separate National Parks. All offering bushwalking, rock climbing and picnicking. This area may be accessed through the township of Glass House on the Glass House Mountains Tourist Drive. From town, travel along the Glass House Mountain - Coonowrin Road.